Every weekend across Australia Delta Force plays host to thrill-seeking groups of party people. To help you get the party started, we have a range of invitations for you to download, print and send around to your friends. Click to view the invitations available for download. Delta Force Paintball is the world’s largest operator of paintball games and your day out at one of our movie-set paintball centres will be the most adventurous and talked about birthday party of the year. In over twenty years of operation Delta Force has hosted countless unforgettable birthday parties for people of all ages. 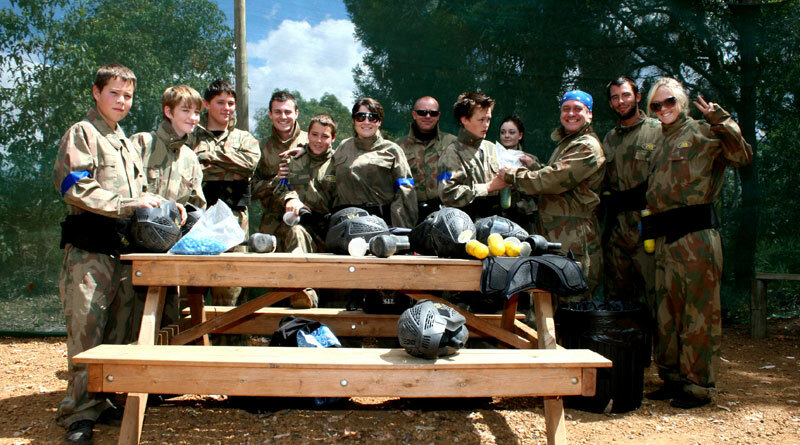 Each week we ensure each and every birthday party is the ultimate paintball experience – from happy birthday wishes to a special game for the birthday boy or girl, a birthday with Delta Force is always an event to remember. We have a proven track record of hosting successful birthday parties and you can rest assured that we’ll look after you and your guests. Our incredible movie-set game zones and state-of-the-art equipment will have all attendees taking charge and living out their wildest ‘cops and robbers’ dreams. All Delta Force centres are complete with picnic tables for you to enjoy your birthday lunch. The base camp will be your headquarters for the day where you can purchase additional paintballs, food and drinks. Here you can also relax in between games and share your war stories from previous battles. Click to check the minimum age for paintballing in your state. Call the Delta Force booking office today on 1300 850 744 to book your next paintball party.